There has been quite a number of Pins on Pinterest showing how to make a ginger bug. It is the base to make ginger ale the old fashioned style. I did this for about 3 months, but I stopped before our summer holidays. My verdict: Most likely this is more costly than buying the own brand of some cheap shop, that only costs a few cent per bottle. And it does take some preparation time! It also is a softer kind of fizzy, it is hard to describe! But you know what you drink and don't have added food colouring or taste enhancing and shelf life prolonging additives. And you help the environment by not buying plastic bottled drinks. Another advantage you can actually use the bug to make various different lemonades/ales. There is no stopping your creativity once you started. 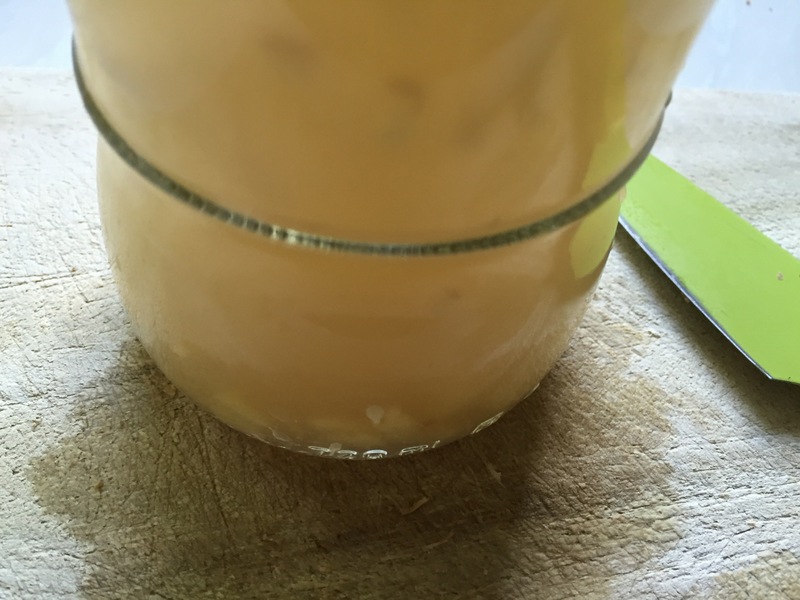 I read many posts and a chapter in one of my sisters books about fermented foods, these all explained more or less the same way of how to get started. All you need is fresh, preferable organic ginger and if you want to speed things up or if you use a non-organic root, that might be treated and you might want to help the bug to get started, then add some fresh whey (can´t buy it? Here is a link how to make some yourself). Ginger is a natural carrier of the fermentation bacteria that you also have in the sourdough which you use for baking bread. This is the reason why it is so easy to get a ginger bug started. 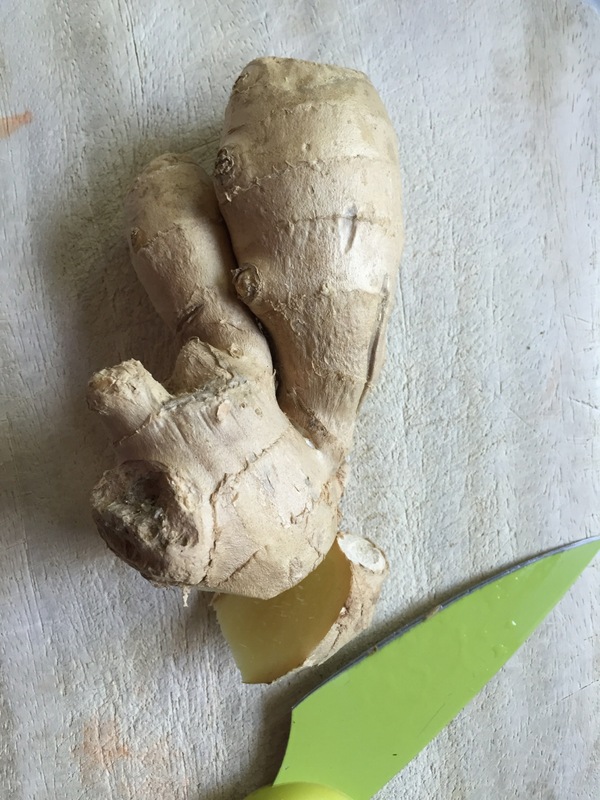 You wash about 2 cm of your ginger root, if it is organic, there is no need to peel it. Then chop it more or less fine. If it is a none organic one and you have to peel it, try peeling it with a spoon! I am not pulling your leg, this actually works better than a knife. Just pull a spoon down the side of the root with a little pressure, and the skin will come off easily! Add 1 cup of filtered water . This is a must! As the chlorine in tap water and a lot of bottled waters, will stop our fermenting bacteria from growing. I tried this the first time with tap water and even though the water here doesn't contain as much chlorine as in most places, it just never got started. 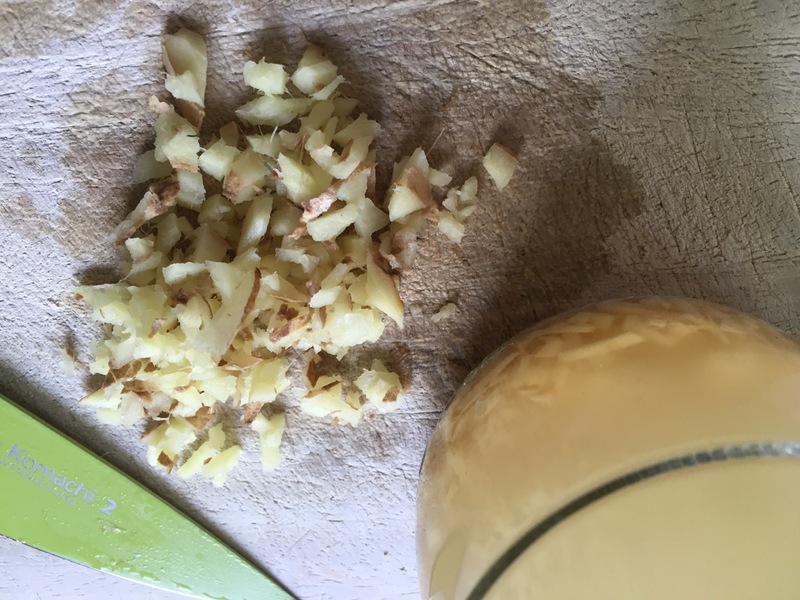 Fill water and chopped ginger into a glas bottle with a wide mouth (plainly for convenience! You don't want to go mad trying to fill in your chopped ginger every day without half of it falling down the sides!) The bottle should be big enough to hold at least 1 litre. Now, for the next week you add 1 teaspoon of chopped ginger, 1/4 cup of filtered water and 1 teaspoon of raw brown sugar every day and stir well. Towards the end of the week you will see your concoction starting to bubble and you get a slightly yeasty smell from it. You now have successfully created your own ginger bug! You now can create your own ginger ale or lemonade! Your bug needs feeding every day if kept at room temperature. If you want to take a break you can keep it in the fridge for up to a week without feeding, but you need to keep it at room temperature for 2 hours after the last feeding before putting it in the fridge! You also need to have it for 2 hours at room temperature before you feed it again after it was in the fridge. For Ginger Ale: chop 2 cm of ginger coarsely, and boil them with 2 cups of filtered water and 1/3 cup of brown sugar. Let simmer on low for 5 min, then remove from heat. Fill into big jug, add 4 cups of cold filtered water and around 2 cups of ginger bug (keep 1/2 cup of ginger bug, pour in rest is what I usually do) stir well then fill into glas bottles (again, wide mouthed ones make you life so much easier!) and screw on lids. leave at room temperature ( not higher than 21C, or these little buggers might get too hyperactive and you will have a big mess!) after 24 hours refrigerate and once it is cool enjoy! In my experience refrigerated shelf life is no longer than a week! If you feel the lids of your bottles and the middle can't be pressed inwards at all, then it might be time to release some pressure, by unscrewing the lids for a second. Lemonade: squeeze the juice of 1 lemon, and grate zests, the zests you add with water and sugar as above and bring to boil as described. The juice I don't boil as the Vitamin C will be destroyed by heat. Pour the juice and your 4 cups of cold filtered water in your big jug. Add cooled lemon zest/water/sugar-mix and stir well! Now proceed as above! A nice variation of the Lemonade is also adding lemon verbena, but be aware of its medicinal qualities (it is very calming (nerves) and soothes the digestive system) Do not use over a longer period of time, and if unsure always talk to your Doctor first! Woodruff lemonade is my boys favourite: I add either 5 twigs of wild or 10 twigs of cultivated woodruff to the Lemonade before boiling! The wild one is much more intense than the cultivated one, that is why you need the double amount! We also made an Orangade, by exchanging lemon with orange in the above recipe, but for some reason my boys were not very gone on it. Lime/Ginger/Peppermint is my favourite version. Before serving any of the above you should pour them through a strainer! Variations are endless as you can see! If you have tried a different one I would love to hear what you thought of it and how you made it!